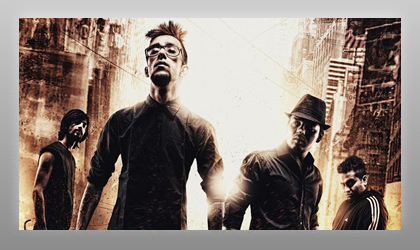 Underground Authority believes making music to express and not to impress and are one of India’s most promising bands. The band looks to embark from their home roots in Calcutta, India and inspire the alternative rock world with their authentic and inspiring messages and musical sound. The Alt-Rock/Rap/Poetry quartet strives to speak up for the commoner through their art, highlighting their problems and issues and hopes to inspire every individual to stand up for themselves and for a better tomorrow. Musically, the band is influenced by Rage Against The Machine, Living Colour and Public Enemy to name a few. Their music and extraordinary live show has helped them earn success as they’ve reached the finals of India’s Got Talent (season 2), one of the country’s premiere music and entertainment shows, were winners of the biggest and most esteemed international band competition, the Hornbill International Rock Contest (2013) in India and performed at India’s NH7 Weekender, one of India’s leading multi-city Alternative/Indie-Rock music festivals.